Carma Critta produce natural healthy alternatives to assist in the treatment of a variety of physical and emotional conditions in pets. 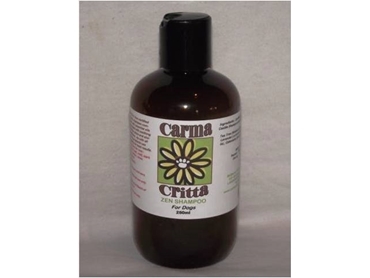 Included in the Carma Critta range of homeopathic animal treatments are Zen animal shampoos for dogs and horses. Zen Shampoo for Dogs is Carma Critta's 'SLS' free certified organic animal shampoo with essential oils of tea tree, lavender, and calendula leaves that leave the dog's coat feeling clean and soft, and with a glossy shine. Zen Shampoo for Dogs is available in a 250ml bottle and may also assist sensitive skins and skin conditions in dogs. Zen Shampoo for Horses is available in a larger 500ml bottle and is also an 'SLS' free certified organic animal shampoo with a combination of tea tree, frankincense, and lavender essential oils to calm and cleanse the horse. This animal shampoo will leave the coat with a glossy shine and silky touch and may also assist with the treatment of skin conditions in horses. These homeopathic animal treatments were born form a love of animals and a passion for aromatherapy. They are made with 100% certified organic ingredients of essential oils, castille shampoos, aloe gels, Omega 3 and 6 oil-based feed supplements, and purified rainwater. All ingredients are sourced locally where possible.